When it comes to branding or re-branding your school, a lot of people underestimate the positive impact it can have. However, there are schools that now embrace marketing. They are starting to realise the impact their brand has on the decision for prospective students and teachers when considering them. We will go through what a brand actually is and why it matters. Once you understand what your school brand is, we have put together some helpful steps on how to create and use your brand successfully. When talking about a brand you instantly think it’s only important for big corporations like Nike, Coca Cola, Disney and others. However, that is simply not true. Having a brand is important in all organisations; your brand is your school's identity and it's the first impression people get. It is especially important for people who don’t know your school as they will form judgements based on your school branding. This can encourage or discourage people to come to your school; your brand communicates to your audience what your school is all about! Why does a school brand matter? It creates a strong identity for your school, making you stand out from others. A brand tells a story. For a school, it can incorporate your values, ethos & personality. Your brand allows your audience to identify what your school is about, making them more likely to select the school to study or work. Having a school brand also builds trust with your audience. If you have a clearly identifiable brand people know who they're working with and what to expect from that school. If you think of well-known businesses we mentioned earlier with their strong brand identity you know exactly who they are and what you are going to get; it is no different for schools. When creating your brand, it consists of lots of branding elements such as your logo, website etc.. Before we get onto to the branding elements, you must define who your target audience is. This will help when creating your brand identity to attract prospective students and teachers to your school that match what your school's vision and ethos are. One way you could do this is to pick 3 - 5 words that best describe your school. For example, your school could be supportive, non-traditional, friendly and rural. These words will help keep focus when building your brand and these words should shine through. Once you have these steps it will really help the designer and they can advise on which colours, fonts and other design elements help best represent your brand. A successful brand consists of certain branding elements. I have split the elements into two categories from essential and non-essential. As you will see, amazing branding material should interlink seamlessly. Logo - This is pretty obvious that a logo is a must for your brand. It's so important as this will go across all media and materials such as your school uniforms, paperwork, website, everywhere! Your logo is what makes your school unique and recognisable. It is beneficial for your school when your logo is amazing and well designed. However, when working with schools I have seen logos that are poor quality and don't reflect their school well. It can be off-putting and convey that you haven't put any effort into your logo. This can leave your audience thinking what else have they not put effort into. This is why I recommend getting a professional designer to create your logo as they will have expertise what looks good and what doesn't. They will also give you a logo brand guideline document of how and where to use your logo. Website - Having a website is so important for your brand! 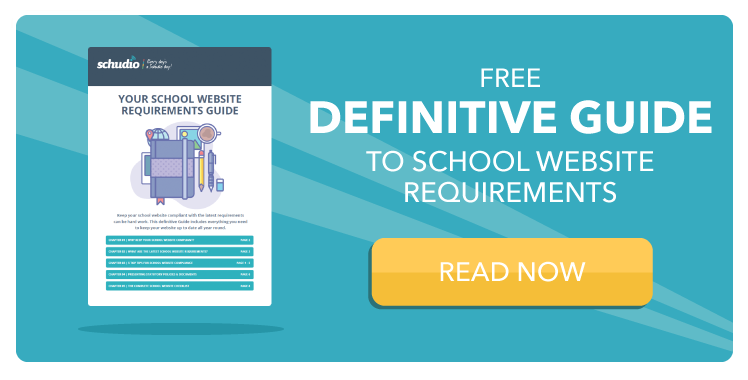 It's no surprise that when your audience is looking for an educational establishment to suit their children's needs, the first thing they do is a search for a school website. A website should inform and showcase the best attributes of your school. It should use the same colour scheme, logo design and fonts to keep it your brand consistent. It's often the first contact that a parent or pupil has with your establishment. Therefore you need to have good content with great navigation and usability. If your website does not encompass these things, it will send a negative message and they will simply click off and look for a better school website to find! Photography - Photography captures the essence and heart of your school. This is a powerful media that can illustrate the message of what life is like at the school. Having beautiful photographs are a must for your brand which can be used across different media. Using the 3 - 5 words you have picked will help the photographer to communicate these words in your images. Motto - Some schools alongside their logo like to come up with a tagline/motto which includes what their school's values and ethos are in a short punchy sentence. Letterheads & Compliment Slips - the reason I have put this as non-essential is that a lot of schools are ditching the paper and going digital to communicate. If you are still using paper, always have your logo on your paperwork, so it is easily identifiable that the information has come from your school. Photoboards & Displays - These are a great way to make your school stand out. Including these into your brand can take your school to another level and make an altogether polished feel. Videography - Videos are becoming increasing popular; like photography, they capture what school life is like but in even more depth and is a really nice media to use. This would be a nice add-on feature, but this can be expensive and time-consuming. Find out why your school should use video to promote your school? You need to keep your brand consistent. Make sure that all brand elements across all marketing channels are the same. I worked with a school once and over the years they had accumulated 4 logos that looked completed different, even though they were for the same school. They used these logos across different marketing channels and if I hadn't known the school, when looking at these platforms they could have easily been different schools. Brand inconsistencies create confusion and diminishes trust with your audience. Like in anything you do, it's always good to have a look at the competitors that are in the same vocation/field as you. This is not to copy but rather get inspiration from them and see what they are achieving. You should also find what makes you different from them and why people should come to your school. School branding is about sending the same message in everything you do as a school. When building your brand, if you follow these helpful tips, you will be well on your way to having a successful brand. If you're unsure where to find a designer, website or photographer here at Schudio we can help you with all of that. Get in contact with us today and we'd love to help you get started on your branding journey.